Brands and their various components such as the logos, color schemes, writing, and history create a psychological bond between a product and its consumers. History’s most enduring brands have made shareholders of the companies that own them rich over the decades. Jerome Smucker, founder of food manufacturer The J.M. Smucker Company (NYSE:SJM), understood this fact over 100 years ago when he founded the company. When he sold products from a horse drawn wagon he wanted to back the quality of his product with a personalized signature on each jar. Today you may associate high quality jam with the Smucker family name and harbor positive memories from eating Jif’s peanut butter and Smucker’s jelly when you were a kid. In its more recent history, during the past five years J.M. Smucker purchased other brands such as Folger’s coffee from The Procter & Gamble Company (NYSE:PG). You may enjoy getting up in the morning to a cup of coffee with this familiar name. As you can see in the chart below, selling products with this type of association and quality benefitted The J.M. 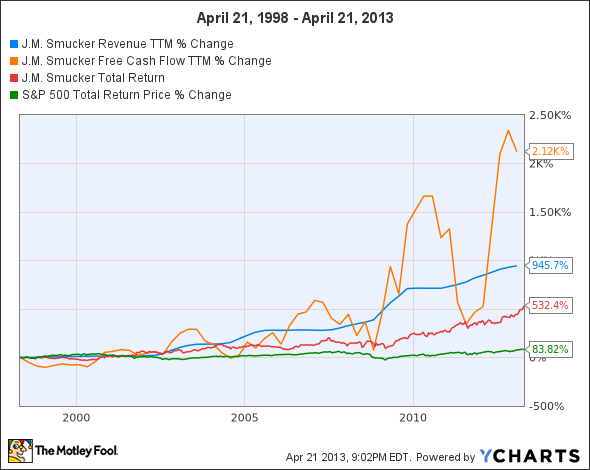 Smucker Company (NYSE:SJM) and its shareholders greatly over the past 15 years. Revenue and free cash flow increased 9 and 21 fold respectively during that time. If you held on to J.M. Smucker’s shares thorough the dot com bubble burst at the turn of the millennium and through market corrections during the last recession you would have outpaced the market by a factor of 6. The future looks bright for J.M. Smucker. Expansion into international territories is starting to pay off. Net sales in its international segment have increased 35% so far this year. Coffee continues its status as the top revenue generator. As long as this company maintains its tradition of quality you shouldn’t need to worry. Also backed by a long history, motorcycle maker Harley-Davidson, Inc. (NYSE:HOG) built an entire sub culture around its name including a merchandise line up complete with jackets, gloves, and accessories to complement your motorcycle purchase. You buy a Harley-Davidson, Inc. (NYSE:HOG) to look tough and cool and partake of rich culture. Motorcycles represent a luxury which means they reside at the low end of everyone’s priority list of purchases translating into recession sensitivity. Still, as you can see in the chart below, despite all of the ups and downs in the global economy Harley-Davidson, Inc. (NYSE:HOG) still managed to expand revenue and free cash flow 200% and 211% respectively over the past 15 years. Total shareholder return outpaced the S&P 500 by a more than 2 to 1 margin.